Mom (86) has mid-stage Alzheimer's. I’m 63 and was recently diagnosed with lung cancer. The good news is my cancer is treatable with chemotherapy. The bad news is Alzheimer’s hasn’t prevented Mom from sniffing out a problem. What will happen when she sees the changes chemo makes in my body? What if she only remembers the word “cancer” and doesn’t understand “treatable?” I don’t know what to tell her. You are not alone. Now that parents routinely live into their 90s and 100s, many caregivers face this dilemma. How do we help the very old deal with the problems facing their adult children? How do we protect vulnerable Alzheimer’s patients while still respecting their need to be involved and care for their families? 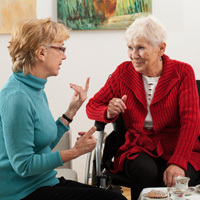 How do we help adult children who become ill continue managing as caregivers? Mid-stage Alzheimer’s patients cannot process complex thoughts. They routinely misunderstand anything except the simplest one-concept phrases and often fixate on words they recognize. To protect Mom from the anguish she’ll feel if she fixates on “cancer” without the ability to also process “treatment,” we recommend simple answers. Distraction and “fib-lets” are your friends. If Mom asks about weight loss or gain, try talking about over-eating or lack of appetite. Do not take on this double-disease whammy alone. Get help: Contact the Alzheimer’s Community Care or the Alzheimer’s Association for assistance with helping maintain Mom/Dad’s and your own care/quality of life as your illness and their AD progresses.